In an earlier post I argued that American slave cotton may have accelerated the Industrial Revolution, but certainly was not essential to it because there were alternative sources of cotton. One of the speculations I aired was: if Lancashire mills had to rely exclusively on inferior-quality Indian cotton from the very beginning, then textile machinery would have been optimised for Indian lint. And now there’s a paper which finds in fact that did happen in the British textile industry during the “cotton famine” of the US civil war: Hanlon, “Necessity Is the Mother of Invention: Input Supplies and Directed Technical Change” (ungated version). I wasn’t going to return to this tired subject, but I keep seeing irritating articles like this or this, or book presentations by Sven Beckert like this which insist on extravagant claims about the “centrality” of slavery and slave cotton to the rise of western industrial capitalism. My previous post was inspired by a wild assertion by Edward Baptist in his crude book that American slave cotton was “absolutely necessary” if the “Western world was to burst out of the 10,000-year Malthusian cycle of agriculture”. More measured language and temperate claims appear in Beckert‘s non-emotional book, but nonetheless its central implication is that industrial capitalism just wouldn’t have been possible without the violent exploitation of all kinds of coerced labour outside of Europe, which he calls “war capitalism”. There’s a quick way to short-circuit all that loose talk. In chapter 25 of Bourgeois Dignity, Deirdre McCloskey has a brief argument that, contra Findlay and O’Rourke, international trade was not an important engine of growth for Britain in the period 1780-1860. Her counterfactual involves halving Britain’s actual cotton textile output as a result of being shut out of foreign markets. It’s a static argument (i.e., not general equilibrium), but McCloskey is convincing that it’s good enough for the job and any dynamic model would not generate very large magnitudes for the importance of cotton. The logic can be transported, with a few adjustments, to the counterfactual of cotton made more expensive by the absence of any coercion in cultivation. If the primary raw material had been more expensive, presumably its impact would have been a reduction in the quantity of output and a reallocation of the unused inputs to other, presumably less productive sectors of the British economy. Since the argument is about as clearly presented as feasible, I simply quote most of the relevant bits, excising only McCloskey’s extended parenthetical asides. Anything in bold is my emphasis. Suppose the cotton textile industry were cut in half by an exclusion from foreign markets… During 1780-1860 therefore the share of cotton in national income would have been 3.5 percent instead of its actual 7 percent. The 3.5 percent of resources would have had to find other employment. 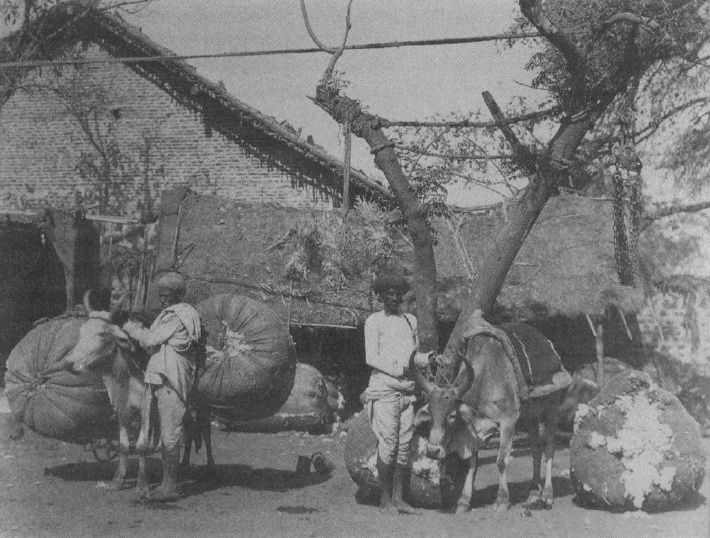 Suppose that the released resources now put to use in road mending and silk manufacturing and so forth would have experienced a productivity change of 0.5 percent per year (on the low end of the available possibilities) instead of the princely 1.9 percent they in fact experienced in cotton. Now we can calculate the counterfact. With the hypothetical halfway cutoff of trade…you can make so to speak a mechanical “static-dynamic” argument as follows. The Harley revision of my table implies that noncotton productivity change can be calculated from (1.41-.07)• (the implied residual productivity change outside cotton) = (0.55-0.13). That is, the implied residual of productivity change outside cotton is 0.42/1.34, or 0.313 percent per year (I retain more than significant digits to avoid rounding errors). The resources in the hypothetical case would therefore contribute (0.035) – (1.9 percent) + (0.035) • (0.313 percent) = 0.077 percentage points a year. The fall in national productivity change can be inferred from the difference between the actual 0.133 percent per year attributable nationally to cotton and the hypothetical 0.077 percent per year attributable to a half-sized cotton industry and the industries its resources would go to. The difference is about a 0.056 percentage point per year fall in the national rate of productivity change, that is, a fall from 0.550 percent a year to 0.494 percent a year. In the eighty years 1780-1860 such a lag would cumulate at monthly interest, however, to merely 5 percent or so of national productivity change. Remember that we are speaking here of doublings of national income 1780 to 1860. You could cut the productivity change in cotton to allow for alleged economies of scale in cotton and come to roughly the same result. No one has shown that such economies of scale were in fact important (though they are important in the imaginings of economists), or that economies or diseconomies of scale in other industries would not cancel the net gain. We are giving the protrade, “dynamic” argument all the advantages. Suppose the scale-effect productivity change were half of the princely 1.9 percent in cotton, or 0.945 percent per year. So now the calculation is (0.035) -(0.945 percent) + (.035) •(0.313percent), or 0.0440 percentage points a year (as against 0.077 without the lost “economies of scale” inserted). National productivity change attributable to cotton falls from 0.133 percent per year all the way down to 0.0440 per year, a drop of 0.089 each year. So national productivity growth would decline on this account in the hypothetical world from 0.55 actual to 0.461 percent per year. The difference in final attainment in 1860 is again small, merely 8 percent of productivity change, and a smaller percentage of national income. Note that the result is forced by widespread character of productivity change (even under the implausible Crafts-Harley calculation of zero productivity change outside the industries I chose in 1981 as the leading ones). Resources displaced from cotton do not simply disappear. They relocate. Their relocation does not result in a fall of national income equal to what they earned in cotton, as assumed by noneconomists. The resources of labor and capital go into other industries, albeit ones with lower productivity change than the amazing cotton textiles. Since cotton was not the only industry experiencing productivity change even in the classic period of the early Industrial Revolution-a point that the economic historians Peter Temin and John Clapham and I insist upon, and historians of technology such as Margaret Jacob and Joel Mokyr have affirmed in detail-the imagined shift is not deadly to progress.’ The dynamic effect sounds promising. In quantitative terms, though, a cotton textiles industry counterfactually smaller (if foreign trade were shrunk) does not kill off growth. It’s another popular explanation that doesn’t work very well. A “dynamic” argument, further, has a serious problem as an all-purpose intellectual strategy. If someone claims that foreign trade made possible, say, economies of scale in cotton textiles or shipping services, she owes it to her readers… to explain why the gains on the swings were not lost on the roundabouts. Why do not the industries made smaller by the large extension of British foreign trade end up on the negative side of the account? The domestic roads in Shropshire not constructed and the brass foundries unbuilt in Greater London because of Britain’s increasing specialization in Lancashire cotton textiles may themselves have had economies of scale, untapped. 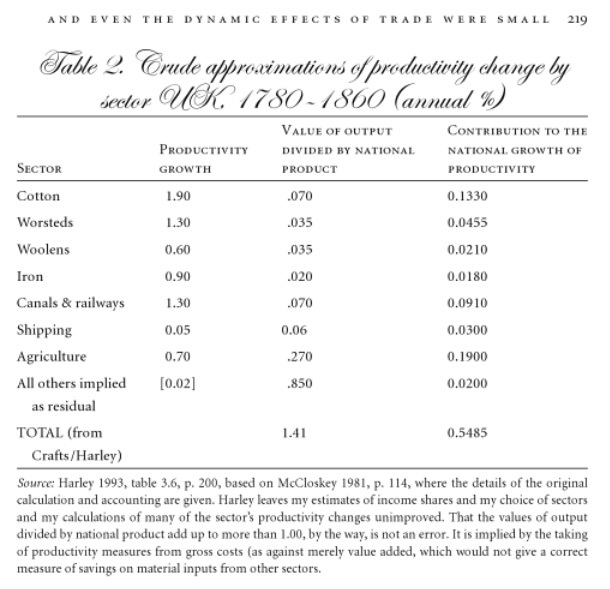 The table above embodies what is known as the “Crafts Harley view” — the controversial idea that the first phase of the British industrial revolution was driven by rapid productivity growth in a few “star” industries and the rest of the economy was largely stagnant. Crafts-Harley is essentially a “remainder” argument. GDP growth was estimated for the period 1780-1860, from which economy-wide productivity growth is derived. Then the productivity growth estimates for the very few individual industries which have actually been micro-studied are subtracted from the aggregate. The remainder turns out to be low. Hence, the “star” industries dominated the IR. I mention all this because IF the Crafts-Harley view is wrong, then that implies the Industrial Revolution even in its earliest phase brought about a broad, diversified, multi-sectoral advance in productivity. And the cotton textile industry, by itself, was even less crucial than McCloskey’s exercise would suggest. Edit: 10 July 2016. I hadn’t seen this at the time of writing, but I should mention Clark, O’Rourke & Taylor, “The growing dependence of Britain on trade during the Industrial Revolution” [ungated version]. The paper estimates the effect of foreign trade on British welfare circa 1760 and 1850: “We find that while trade had only a small impact on British welfare in the 1760s, it had a very large impact in the 1850s”. Herschthal, who specialises in the history of slavery, does not see fit to mention anywhere in the article the classic Time on the Cross by Robert Fogel and Stanley Engerman — even though it established 40 years ago, not only the compatibility of slavery with capitalism, but also the high productivity of slave agriculture and the flourishing of the market system in the slave economy of the US South. TOC even argued slavery would have worked just fine inside industrial factories ! Yet the “new historians of capitalism”, rather like the Argentine junta, have essentially disappeared Fogel and Engerman. And then they claim to have invented the wheel. The narrative these “new historians of capitalism” (who are from US history departments) keep repeating is, before they started uncovering the truth, no one had noticed the capitalist nature of slavery. Nobel laureate and chief desaparecido Robert Fogel is not mentioned even once in Sven Beckert’s Empire of Cotton (***) even though its subject is the centrality of cotton and labour coercion to the rise of industrial capitalism. Amazing ! It’s meme replication via memory erasure. Ever seen the French-language film Danton by the Polish director Andrzej Wajda ? It’s about Georges Danton, the first president of the Committee of Public Safety who was later guillotined by Robespierre during the Terror. There’s a scene in the film with Robespierre visiting the studio of the painter Jacques-Louis David. 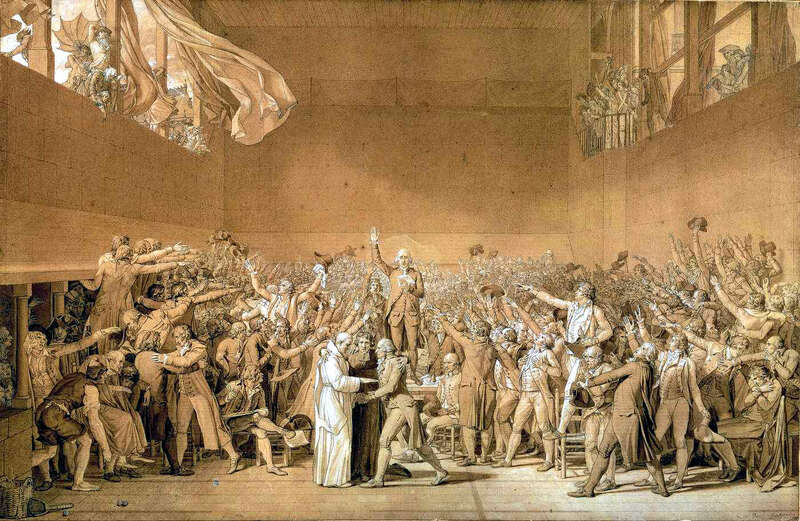 In the background is the yet-unfinished famous painting, “Le Serment de Jeu de Paume” (The Tennis Court Oath). Robespierre orders David to erase the figure of Fabre d’Eglantine, who has just been purged. It’s a Polish director’s allusion to Stalin’s doctoring of photos to remove purged rivals. This entry was posted in cotton, cotton textiles, great divergence, historians of capitalism, Industrial Revolution, Slavery and tagged cotton, Deirdre McCloskey, Edward Baptist, Eric Herschthal, historians of capitalism, Industrial Revolution, Robert Fogel, Slavery, Sven Beckert. Bookmark the permalink. Spot on – huge evidence that cotton is not of singular importance in the IR, even when one takes financing into account. Caroline Heindel, my high school American History teacher, insisted that we get beyond the survey book and encounter Beard, Stamp vs Fogel and Engermann, etc. I learned more than I did in my college survey course (at Oberlin) and indeed would have been better advised simply to deepen my exposure to the controversies and theories that she referenced two years earlier. I have the Nykert book and found it unreadable – perhaps because I’ve read enough history to already know about “War Capitalism”, etc. I kept asking – who is this book for? It seemed to be for people who know so little history that there is no chance they would be reading this book. But I am skeptical around this no-cotton IR counter-factual. It assumes there would have been markets for the products of all this redeployed capital. Would there have been? Especially equivalent export markets? McCloskey’s counterfactual was halving the cotton output, not no-cotton. Regarding export markets : no, you would have had less exporting, period. In the factual world, Britain specialised more and more in cotton production, and every marginal output of cotton went overseas, while it imported more and more food. So the effect of curtailing cotton output would have been a change in Britain’s pattern of trade and mix of production. Note: I’m not arguing that “slave cotton” was necessary for the IR to happen. And I haven’t read McCloskey. But isn’t it odd to argue that the rising bourgeois didn’t “need” slavery, when they embraced it so eagerly? The willingness to exploit slavery seems part and parcel of the broader phenomenon McCloskey is pointing to. And if she is arguing that a certain set of attitudes made modern economic growth possible, don’t we have to take the bad with the good? *Yes, we know from your work that Broadberry’s series contain some perhaps-complacent assumptions, but this is the modern and hopefully more reliable end. Striking, though, that Mitchell has absolutely no pre-1815 agricultural numbers. Perhaps even the modern “preliminary estimates” are guesses! The ability to pay for food imports is proportional to the ability to export. So if higher raw cotton import prices reduced textile exports then the UK would have been obliged to import less food — or more precisely, a smaller volume of imports in money terms. Yes, agricultural productivity grew more slowly than industrial productivity, so the higher population did require more food imports. The combination of all these things implies that the UK would have been obliged to import fewer luxuries and spend the reduced export earnings on cheaper commodity foods. And/or Britons would have reduced non-food consumption in general (i.e., increase savings) in order to export more of the foregone consumption, in order to afford the food imports. The willingness to exploit slavery seems part and parcel of the broader phenomenon McCloskey is pointing to. And if she is arguing that a certain set of attitudes made modern economic growth possible, don’t we have to take the bad with the good? Why should I care about that ? I like McCloskey the cliometrician. McCloskey the rhetorician, not as much. Bourgeois Dignity is useful as a chapter by chapter polemic against every pet theory of the IR. Its value is negative; when it gets positive with the bourgeois dignity stuff I commune with my inner positivist. Why should you care? Well, you might care about it because of the “Clio”, or “history”, half of cliometrics, which is a discipline that not only advocates economic modeling and performance measurement, but which emphasizes the impact of institutions and institutional changes on economy and, therefore, society. So the question is not just whether, from an economics perspective, American slavery was a necessary condition of British industrialization. The question is also whether, from a historical perspective, American slavery was a consequence, perhaps a necessary consequence, of the set of attitudes and inclinations that a newly-energized bourgeoisie applied to the spheres of manufacturing, trade, and colonization. Why ask whether these mojo-ed economic actors could have done without slavery? If they perceived it as expedient, it was going to happen. With capitalism, absent legal prohibition, is there any counter-factual to perceived advantage? You mistake my meaning. I reject McCloskey’s view that the “great enrichment” was due to some ethical revolution. So why should I care if her “ethical revolution” is (allegedly) incongruous with the fact of industrial-scale slavery ? The question is also whether, from a historical perspective, American slavery was a consequence, perhaps a necessary consequence, of the set of attitudes and inclinations that a newly-energized bourgeoisie applied to the spheres of manufacturing, trade, and colonization. Why pin it on some new-fangled “attitudes and inclinations” when slavery had always existed, and the scale and character of its exploitation quite obviously depended on the production regime ? 19th century cotton agriculture in the US was essentially industrial and “proto-Taylorist”. That hadn’t been quite the case in the 18th century with tobacco, but had been with sugar in the Caribbean. Romans had latifundias, but Arabs generally didn’t. I’m not saying attitudes & values don’t come into play. The transition from slavery to serfdom in Europe is not quite understood. No claim here that slavery was a bourgeois invention. Only that a cliometric approach shouldn’t be too selective in noting the effects of its chosen causes. Meanwhile, I’m going to reread “Time On The Cross”. I might just have it in some box downstairs. Only that a cliometric approach shouldn’t be too selective in noting the effects of its chosen causes. I have no idea what that means. The McCloskey passage above is intended as a preliminary accounting of the impact of the cotton textile sector on productivity growth in the 1st phase of the IR. It is not asking “what caused the Industrial Revolution” (including the high productivity growth in textiles). I’m going to reread “Time On The Cross”. I might just have it in some box downstairs. Without Consent or Contract is more up to date and has superseded TOC, which I mention primarily for historiographic purposes. Yes, but it was TOC that was accused of the fault around which you have “no idea”. I don’t mean the no-fault-at-all of being insufficiently moralistic. I mean the fault of emphasizing economic over social impact to the point of seeming to wear blinders. I think that was probably a bad rap on TOC, which is why I want to go back to it. The more you elaborate, the less I understand. The narrow quantitative focus of the counterfactual is compelled, induced, motivated, prompted, and dictated by the nature of the initial claim — American slave cotton was indispensable to the IR. So the natural reaction is to investigate the quantitative importance of cotton textiles to the IR. Besides, those topics are well covered by qualitative histories. There are always lots of qualia in clio. The lacunae are usually in the metrics. Actually you do understand. I was just saying that the “initial claim” was, for me, the wrong question. Since McCloskey’s subject was the impact of changing attitudes towards commerce upon economic growth, I was asking whether it wasn’t more interesting to “change the mix” in that attitude set. Given her hypothesis (and I only know it crudely from the publisher’s blurb) I find it more interesting to ask whether a bourgeois-driven economic renaissance would have been as “successful in general”* without slavery as with (and not just for the BIR). Your question is without cotton (and implicitly American slavery) or with (and just for the BIR). I grant that your question is more precise and more answerable. But it seems that slavery was something of a growth industry over the whole early-modern, European colonization period. What, if for the same period, it had been “against the rules”? Instead of accepting the cotton-for-slavery proxy, my counter-factual is slavery itself. Now, “no slavery” does not necessarily mean better, even if equivalent economic growth were achieved without it. It seems that Fogel and Engermann were all too clear-eyed about this, and hence the uproar. That nineteenth century slaves might have been better off, by some measures, than nineteenth century factory workers or a twentieth century black underclass was not a comfortable question. I have no problem with it at all. It does not trivialize slavery or make slavery acceptable to say that, in some places and times and in some ways, there are other things in the world that are as bad or worse. meaning, not using just the most common measures of economic performance, GDP and per capita GDP, but looking at growth, distribution, and social consequences. That was the reason for the North quote in the earlier post. In the previous post, the last section was supposed to be a footnote to the asterisk in the first paragraph. Donaldson, Dave, and Richard Hornbeck. 2015. “Railroads and American Economic Growth: A “Market Access” Approach”. Yes, I know that paper. But in some ways it’s a vindication of Fogel. Instead of Fogel’s finding that the social savings of the railroads in the agricultural sector were 2.7% of GDP, D & H find 3.22%. Not a trivial difference, but also not an earth-shattering one…. I am going to do a post one day on Gutman’s The Numbers Game. Even in the final paper there quite dramatic statements about impacts that were outside the social savings computation, such as the loss of value of agricultural land. It’s the spread of effects that interests me, perhaps partly because I’m too new to the literature to get my mind around conclusions based upon a single unfamiliar measure, such as social savings, or even TFP. As I reread your post yet-again, I also realize that my point argued above is really no different than than Eric Herschthal’s in the review quoted. I was just taking (a hypothetical,version of) McCloskey to task for leaving slavery out of the balance sheet, which maybe she doesn’t even do. Enough of this one, except to note that one pair of writers who do not fail to cite Fogel and Engermann are our favorite Guldi and Armitage, p. 97f. They graciously note that, having been “banished for its sins”, cliometrics may recover in the new big data ere that they herald. Isn’t that nice? Meanwhile, yesterday, one of those fortunate accidents that can happen with new retail omni-channel fulfillment systems: the “Evidence and Methods” supplement to “Time on the Cross” arrived first. So I got to begin by reading Appendix A, which is exactly the sort of dissection of the differences between “history” as commonly written and “social science history” and worthy successor to Braudel’s ‘combat’ that “The History Manifesto” isn’t. The defense of the difficult and even-then-becoming-unfashionable ideal of dispassionate and unbiased analysis is particularly good – and a wonderful antidote to much that has been written since. But I also figured out that I can’t possibly have read this in high school. I graduated in 1967 and the famous explosion at the Economic History Conference, revisited in Appendix A, occurred in September of that year. So the dimly-recalled controversy to which I was introduced the previous year must have been Stampp vs. Elkins (the other Stanley). It’s possible, of course. My teacher (and her Ph.D. candidate husband) may well, even probably, have known of Conrad and Meyer’s essay, and she might have mentioned it in class to introduce the profitability question, but I don’t remember those names. “Her counterfactual involves halving Britain’s actual cotton textile output as a result of being shut out of foreign markets. It’s a static argument “ahhh…the counterfactual, you’re talking about fiction, right?